The United Kingdom gained control over Kuwait, when Sheikh asked the British authorities for protection in 1897. The agreement was signed in 1899, according to it Britain would control foreign policy and security of Kuwait. Kuwait experienced a period of prosperity driven by oil and its liberal political climate from 1940s to the 1980s. In the 1950s Kuwait became the largest oil exporter in the Persian Gulf region and the massive growth of economy attracted foreign workers from Egypt, Palestine and India. 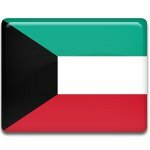 Kuwait became totally independent from British protectorate in 1961. Sheikh Abdullah Al-Salim Al-Sabah became an Emir, who ruled the country till his death in 1965. Parliamentary elections were held in 1963 and Kuwait became the first country in the Persian Gulf to establish a constitution and a parliament.